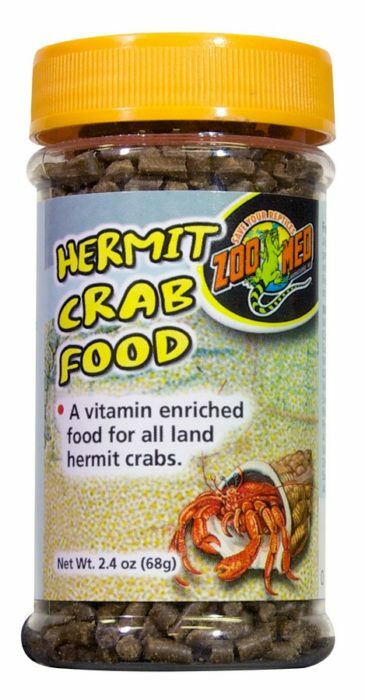 Hermit Crab Food | Zoo Med Laboratories, Inc.
Add one teaspoon of food to the food dish per Hermit Crab being fed. Place Hermit Crab on top of food. Moiston food for best results. Replace uneaten food daily. Store in a cool, dry place. Fish Meal, Soybean Meal, Wheat Flour, Wheat Middlings, Shrimp Meal, Corn Gluten Meal, Corn Distillers Dried Grains, Squid Meal, Monosodium Phosphate, Wheat Gluten, Lignin Sulfonate, Lecithin, Fish Oil, L-Ascorbyl-2-Polyphosphate (stabilized Vitamin C), Choline Chloride, Vitamin E Supplement, Niacin, Calcium Pantothenate, Riboflavin, Thiamine Mononitrate, Biotin, Pyridoxine Hydrochloride, Folic Acid, Vitamin A Supplement, Vitamin D3 Supplement, Vitamin B12 Supplement, Manganese Sulfate, Zinc Sulfate, Ferrous Sulfate, Copper Sulfate, Sodium Selenite, Potassium Iodate, Propionic Acid (preservative), Ethoxquin (preservative).